Here is a short excerpt from the Fort Wayne (IN) Journal Gazette’s article about American hero Louie Zamperini appearing this week at Grace College. To read the entire article, click here. 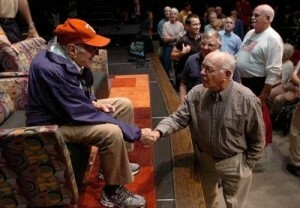 Lewis Neibert, right, from Tippecanoe Lake shakes the hand of Louis Zamperini, 94, a former Olympian, World War II POW and the subject of the book “Unbroken” by Lauren Hillenbrand. WINONA LAKE – They say that time heals all wounds. Louis Zamperini, though, in a discussion before a packed arena at Grace College in Winona Lake, has a different answer. Faith, being born again and being willing to forgive is what really heals. On Wednesday, 66 years after suffering two years of brutal abuse at the hands of his Japanese captors in World War II, the 94-year-old Zamperini spouted not bitterness but humorous stories of those times.